The Academy Awards ceremony is one of the most anticipated red carpet events of the year, and while its main intention is to honor artistic merit, the most avid of viewers knows that it is just as much about the gowns, the hairstyles, and the jewels. While all the celebrities are celebrating, why not plan a party of your own? Pull out your favorite recipes, hang some sparkling decorations, and invite your fellow 'star gazers' for a night of fun, games, and everyone's favorite gold man, Oscar. 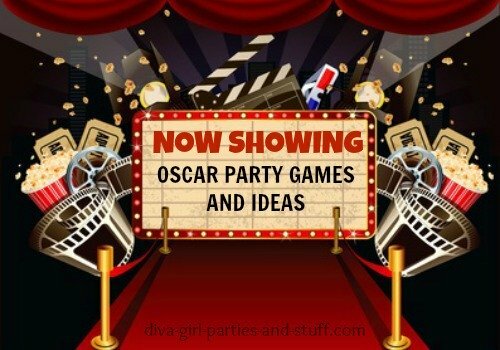 So, if your ready to host an Academy Awards party, you'll need some Oscar party ideas and some VIP All Access passes. You could go casual, of course, but why not serve up a formal party and have your guests walk the red carpet in their finery? Enjoy the show and consider kicking up the fun factor by awarding "Diva Statuettes" to guests for their best dramatic and comedic performances during the past year. Since the main purpose of any Oscar party is to gather friends together and enjoy the Academy Awards, be sure that the games and activities you choose enhance rather than detract from the main event. To give your party an authentic celebrity feel, pre-arrange for a few of your family or friends to pose as photographers, paparazzi, or media personnel and welcome your guests with flashing bulbs and inquiring interviews. You could even rent a limo to park in front of your Oscar party venue and have guests pose beside it, on it, or in it, for some great party portraits. 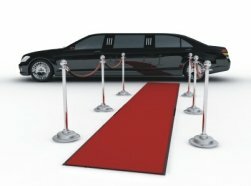 If time allows, you could offer short rides so attendees feel like they are being treated in real celebrity style. 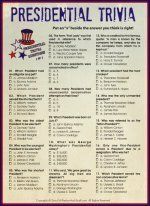 Upon arrival, give guests ballots with the names of nominees for each category and have them vote for their choice of recipient. 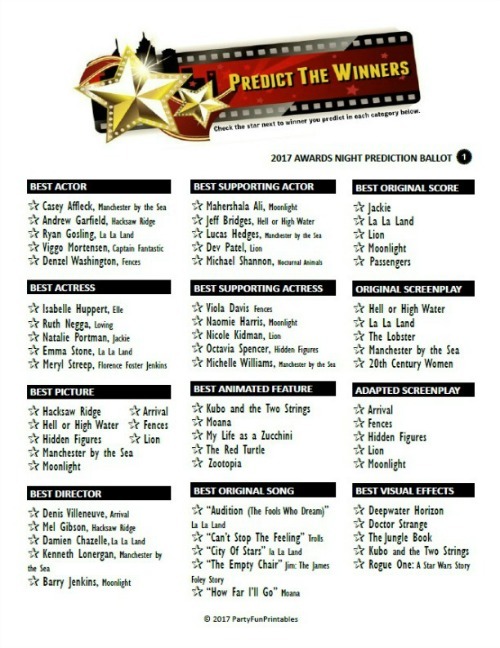 Give a prize, such as a plastic Oscar replica, to the person who correctly predicts the most winners. 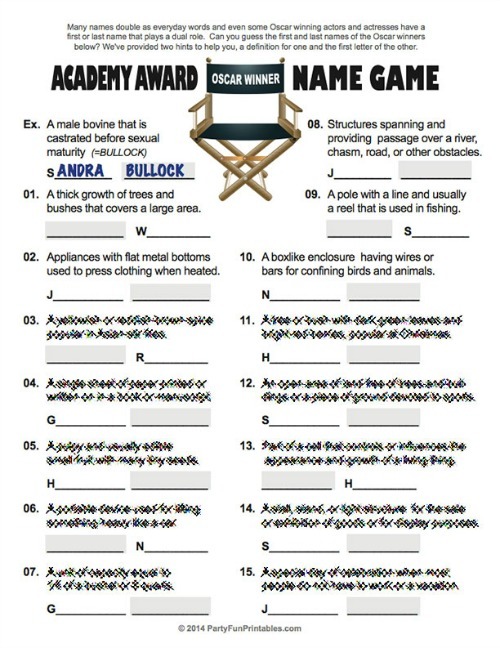 A long awards show also means a lot of long commercials, so fill in the breaks with Movie Bingo or Oscar trivia questions. You could award small prizes or candies for each correct answer, or tally the score and give the winner a larger reward. Having your guests correctly match a list of celebrities with the films they starred in is another great way to test movie memory. Couple the most spectacular celebrity gathering with a few carefully chosen games, and your Oscar party just may win a few awards of its own. 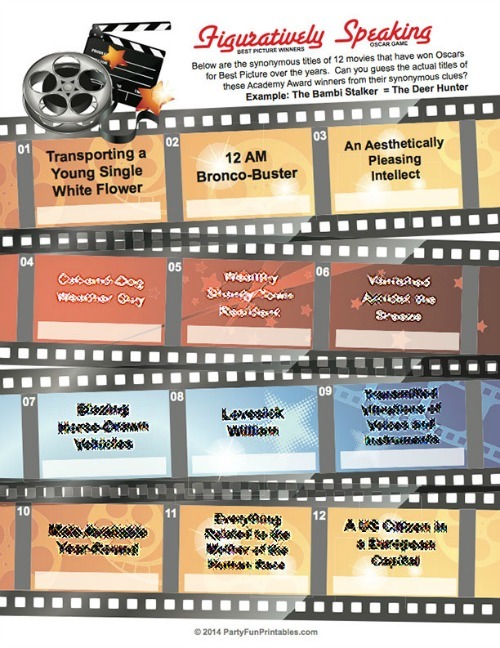 The size and elaborateness of your Oscar party will ultimately determine your choice of venue. Of course, your own home is the most cost effective, but if your guest list is too large, your space is too small, or you need a more convenient location, you may wish to consider alternate options. You could rent a community centre, hotel ballroom, or even a tea room. For a smaller gathering, you could use a fancy hotel suite or a restaurant meeting room. Attendance at one of Hollywood's most prestigious events should begin with an equally impressive invitation. Create (or find online) a template for a Hollywood star and personalize it for each guest, or make a movie ticket with the date, time, and location of your event. 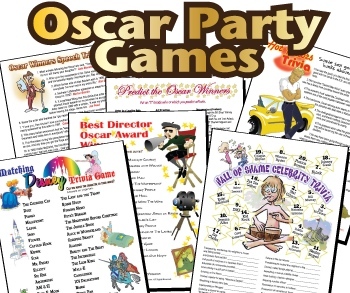 If you are able to hand deliver your invitations, purchase plastic Oscar statuettes and print or attach the party information to the base. For the more creative hosts, use black and white construction paper to design little tuxedo jackets with lapels that open to reveal the invitation inside. Remember to include all important information and indicate whether your Oscar party will be a casual event or a formal affair with fancy gown and tuxedos. You may even enjoy having everyone come disguised as their favorite celebrity, and informing guests that there will be a special prize for the best costume. Also, consider including an Oscar nomination card in your invitation and request your guests choose who they will win each of the main Academy Awards on Oscar night. Whether you want an evening full of all the ostentatious glitz and glamour, or a small, simple gathering of friends, it is not difficult to give your chosen venue that dignified ambience worthy of the stars. Begin by rolling out the red carpet so your guests can make a regal and stylish entrance. Choose a dual color scheme, preferably black with either gold, red, or silver. Cover tables with table coverings in keeping with your party colors and use matching metallic tableware and elegant glassware. Creative centerpieces can be made by filling top hats with candy or flowers, or for a more opulent look, place crystal bowls or champagne glasses filled with colored water, jeweled stones, and floating candles on mirrored tiles. Scatter star shaped confetti and glitter across tables, countertops, and even flooring. Drape metallic curtains across walls, hang silver or gold stars from ceilings, and place cut outs or framed black and white photos of celebrities around the venue. Ask your local video store if they are willing to part with old movie posters. Use strands of star shaped lights, star shaped candles, and inexpensive plastic chandeliers for lighting. Rolls of film, cameras, and Oscar replicas may be placed on various surfaces. Make bouquets of star shaped balloons, weight the bottoms, and place them in corners, at table ends, and on either side of doorways. If you will be hosting your Oscar Party at a larger venue, create a Hollywood sign, place a lighted marquis sign at the entrance, or set director's chairs and movie clapboards around the room. As guests are arriving, play the soundtracks from both current and past Oscar nominated films. Of course, the focal point of the Oscar party is the awards show itself, so make sure the television is in a central location, or if space and budget allow, rent large screen t.v's so the event can be easily viewed by all. Since everyone will want to spend the evening gathered around the television, it is important to serve easy to eat foods. Hors D'oeuvres, finger foods, and dainty desserts or pastries are ideal. For a more relaxed atmosphere, serve food buffet style. You can give your table an elegant look by placing food on silver platters and use movie clapboard place cards to label dishes. Sprinkle food with small, edible, silver balls found in the baking section of your local grocery store. Purchase star shaped crackers, make star shaped cookies, and even serve star shaped sandwiches on fun trays like a clapboard platter. For an extra special touch, especially if you plan on eating early, fill top hats with various flavors of popcorn for your guests to enjoy while watching the show. If you desire an extraordinary air of sophistication and your budget allows, hire a catering company for white glove service. Of course, drinks should be as fashionable as the nominee's designer gowns, so serve all cold beverages in elegant stemware (plastic can be purchased inexpensively). Remember your guests will be driving home, so have several non-alcoholic options available. Try making a red or gold punch, or find interesting recipes for fancy cocktails. You could even formulate your own original creation and name it in honour of your favorite celebrity. Although prizes and favors are not necessary, they are a thoughtful way of thanking your guests for coming to your Oscar party as well as commemorating the star-studded evening. And since your party is all about the 'stars', choose from a variety of star shaped gifts such as paperweights, business card or memo holders, picture frames, and key chains. When it is time to play any games, hand out pens with light up stars on top or reward winners with star shaped chocolates. You could design your own 'thank you note' cd covers and slip them inside soundtracks from Oscar winning films, or dvd's of nominated movies. If you have no place to store decorations following the party, you could allow guests to take home some of the top hats, boas, centerpieces, or celebrity portraits. If you don't mind sending your guests a belated gift, frame some of the pictures taken throughout the evening and send them at a later date. So, whether your evening will be an extravagant affair or a casual gathering, with a little thought and planning, your Oscar party, like its celebrity packed namesake, will be one of the most memorable and exciting events of the year. If you love Hollywood, movies and glam as much as we do, then you will surely be anxiously anticipating the annual rash of film awards every spring. The film awards are a great way to get your friends together to dress up, walk the red carpet, drink champagne and walk home with outrageous goody bags. If you start now, you can plan a memorable "viewing" of the awards show with all your friends in the utmost of style. So get your Hollywood ogling pals together, dress up, dress down, dress all around, prepare a delectable feast or just simply order pizza.